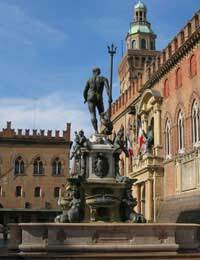 The northern Italian city of Bologna is famous forits university, for its endless porticos, a ratherfetching statue of Neptune and a pair of splendidmedieval towers. But to the nation it is known as Lagrassa, the fat. This is not, you may think, the sortof label that is going to invoke much civic pride. Butfor the Bolognese, it is one that they wear as proudlyas their Gucci and Armani. For La grassa reflects aculinary tradition that is, dare we say it, the envyof the rest of Italy. A short stroll through the back streets offers uptempting windows filled with pastries and cakes, orfresh pasta and cured meats, that are a testament tohow seriously the culinary art is taken. Thisdedication is mirrored in the eyes of those gazing inthrough the glass. There is a care taken in the preparation of food andproduce that is complemented by a receptive audiencewilling to take the time to appreciate it. Whether itbe art, politics or sport, in Italy the most importantthing is to have passion for what you are doing. Thesame philosophy is applied to eating.It is found in every region of the country, eachfiercely proud and protective of its own signaturedishes, and it inhabits everyday conversation on aregular basis, preferably a conversation that takesplace over a meal, or at the very least an espresso inthe bar. Italy is a deeply Catholic country that views thefamily as the foundation of society. And where is itthat mothers and fathers, sons, daughters and cousinscome together to argue, to discuss, to bond? Yes,that's right the dinner table. It may sound all ratherclichéd, the harassed but attentive mamma working herway through creating four or five courses a night forla famiglia, but it is a scene that if not entirelydovetailing with the realities of 21st-century workingschedules in post-industrial Europe, still has apowerful resonance. Tourists seduced by this popular image flock to thecountry in their millions every year. And while theyare squeezing into corner tables for lunch inanticipation of an authentic 'experience', they aremissing the sight of flocks of Italian teenagersdescending on branches of McDonald's and Burger King.So, no, Italians are not immune to the enticements ofthe multinational food giants, but even here, whatother country would respond to the inroads made by thefast-food industry by, wait for it, initiating thedevelopment of an international organisation calledSlow Food, dedicated to preserving and promotingtraditional culinary values? And if all that doesn't convince you that the Italiansthink longer and harder about food than anyone else,consider another great passion of theirs, football.When the national team suffered a disastrous World Cupcampaign in England in 1966, they were met on theirreturn at the airport by a barrage of rotten tomatoes.Rotten, mind. You wouldn't catch the Italians wastinggood food.